An unusual exhibition took place in Joburg this week – all part of a campaign to promote Native VML’s client Nestlé South Africa, and in the spirit of Native’s branding philosophy of creating meaningful communication that is more than a brand message, but an experience for the consumer. 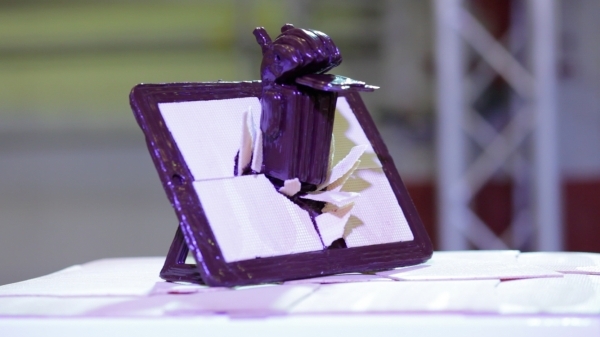 To celebrate the announcement of Google’s Android KitKat operating system, Nestlé and Native presented Chocnology – an exhibition of 3D-printed chocolate sculptures created by South African artists, using AndroidKitKat as inspiration. Nestlé has always been about ‘Good Food, Good Life’ and to celebrate this philosophy in South Africa, along with the announcement of Android KitKat, Nestlé wanted to give the country ‘a break’ with an original idea, says Kevin Corlett, business executive manager, chocolates atNestlé. Although the project culminated in a real-world exhibition, the entire process and the story behind Chocnology began with digital consideration. All designs were created using the Android operating system and freely available online 3D modelling tools. To produce the artwork, a 3D printer that traditionally uses a plastic-based filament was manipulated to use chocolate as its raw material, allowing the creation of intricate, three-dimensional sculptures, explained Ryan McManus, executive creative director of Native VML. The Chocnology designers included tech analyst Liron Segev; Dale Halvorsen’s illustration alter-ego, Joey Hi-Fi; Studio Muti’s Mine Jonker; and talents from Am I Collective and Orijin were among those who contributed to the exhibition. “Printing in chocolate was extremely challenging and there were numerous constraints in terms of complexity, size, weight and shape. The model’s designs had to be printed into bite-size pieces and constructed by hand. It was imperative to remain true to the original vision of the artists and create visually rich and beautiful pieces without letting the constraints hinder the end results,” said McManus. Because of the biodegradable nature of the material, the artworks could only be constructed just before the exhibition opened and it was only open to the public for a limited three days at the Museum of African Design (MOAD) in Johannesburg’s Maboneng Precinct. Jingle Bells, Jingle Bells… the Christmas decorations are up and out come all the special combo/gift/deluxe/etc festive season gifting ideas from brands. First up is Southern Comfort with a ‘Festive Freebie Pack’ to spice up your summer. It includes a 750ml bottle of Southern Comfort Original and two free 200ml mixers. Each pack has a different ‘surprise’ combination of cola, lemonade or ginger ale cans. Then there are free red or green sunglasses and belts attached to 750ml Southern Comfort Original and the 750ml Southern Comfort Lime bottles. The limited edition packs are available at Spar tops and Makro stores. 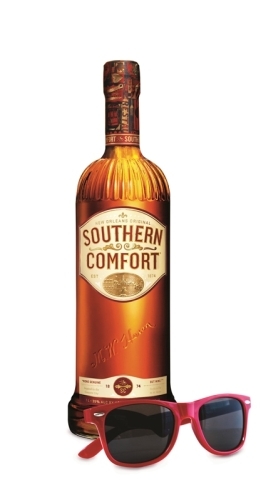 The campaign hashtags are #whateverscomfortable / #southerncomfort. The gift packs are described as “awesome” by the press release, but I wouldn’t go that far, although it is nice to get free stuff. I always buy the magazines that have those free dinky little handcream samples in them because they fit in my handbag! Tête de Cuvée Galpin Peak Pinot Noir is Bouchard Finlayson’s Icon Wine, available from the Bouchard Finlayson vineyard Tasting Room at R683 per bottle, making it very exclusive and “the perfect Christmas gift for wine fans” as touted by the press information. The wine has been collecting awards for over a decade – the 2010 vintage recently won Gold at both the 2013 Decanter World Wine Awards in London and the China Wine and Spirits Awards (CWSA) in Hong Kong. Winemaker and ‘Pinot Pioneer’ Peter Finlayson considers the 2010 Tête de Cuvée edition, a barrel selection of the best from the 2010 vintage, to be his top Pinot Noir since 2005 and 2007. The 2010 edition matured in 100% new wood and is a robust, dark and full-bodied wine with real complexity, rich with a delicious core of blueberry, wild cherry and fresh fruit flavours. It has a strong finish – and lots of ageing potential. Rather a nice stocking filler, I’d say. Provantage is having a phenomenal growth year. It’s only a year since they launched the Airport TV network, but they’re already rebranding to refresh the look. The overhaul comes with sophisticated changes inside and out. The team collaborated with international interface design specialists and employed the latest imaging software to come up with a sophisticated new channel identity with wide appeal, entitled Pure Air 1.0. Updates scheduled for early next year include ‘Pure Airport’ in February and ‘Humans that Fly’ in April. The new head of content is Jacques du Preez, ex-KykNet (no relation to Provantage CEO, also Jacques du Preez. Someone needs a nickname!). 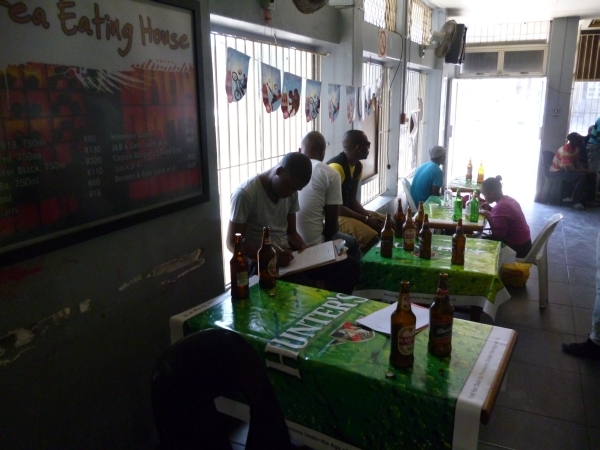 Then, shortly after launching their mall branding offering, Provantage has also launched NightLife as part of the ProActive portfolio, to reach clubs, pubs and taverns. Provantage director, Vaughan Berry says nightlife venues are an integral part of communities and for brands wanting to tap into this market, the key lies in creating experiences that are not only relevant, but memorable. “NightLife effectively takes brands to these sought-after audiences in settings that are relevant and influential. NightLife provides an assortment of media offerings from promotions, fixed and mobile media opportunities, point of sale erection and route to market solutions. “Our brand ambassadors are trained to drive awareness of brands, products and services amongst an adult audience in these environments. This is where people enjoy themselves with their peers and this makes them highly receptive to messaging and product information. Our specialist teams are also able to conduct surveys with state of the art systems that deliver real-time campaign reporting,” Berry explains. 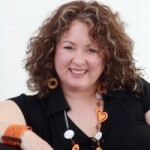 Shelf Life by Louise Marsland is a weekly column on MarkLives. Tweet new product, packaging and design launches to @louise_marsland or email her at louise.marsland at gmail.com. Want to sponsor Shelf Life? Contact us here. 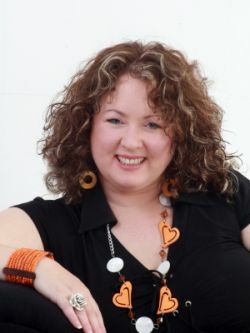 Louise has written about the FMCG, media, marketing and advertising industry for 18 years of her 25-year media career as a former editor of magazines AdVantage, Marketing Mix and Progressive Retailing, as well as websites Bizcommunity.com and FMCGFiles. She currently edits the weekly Wednesday Media & Marketing Page for The New Age newspaper; and is the co-founder and publishing editor of South Africa’s industry trendwatching portal, TREND. at www.trendlives.info, in partnership with MarkLives.com.